What's your Bangalore Bus dream? I will tell you mine. Take local area bus to get to nearest Large bus stop in your sub-urb or locality. Or take your car to the Park And Ride Plaza in your sub-urb. Then change to a Big10. Dedicated lanes at places make sure you feel good about watching the cars wait in jams and chaos. Get down close to your office, then switch to Last Mile shuttle to reach office. Carry your bicycle on odd days, or try autos or taxis if you miss the local shuttle or are in a rush. This is more like continuation of some comments on this crib about incomplete incomplete Big10/Circle routing work. Since BMTC is hard at work these days, if we talk doable suggestions and sense, good chance that some of these may get implemented. So let us put on our constructive hats and go. So far, many of us here buy into the circular grid with direction-based radial and circular routes. Of the 12 Big10 routes, most are doing well we hear. 3 or more Circular routes in operation now. Some pictures to illustrate what we talk and understand of the eventual system that could be tried here. What are the big next steps needed now? Disclaimer: Talk at city level, use personal needs as examples, not summaries. Also, there is nothing new in this top-5 list, its only a distillation/summary of various recent discussions. Only value I am adding is - listing them in order of priority, and this ordering is based on small little surveys I keep doing with my friends, colleagues etc. There are several ways of improving on this. Shuttles to major job centers from nearest stops on Radial or Circular route. Regular Metered Autos - either by deregulation, or by tighter regulation. but Autos have an important role to play. I know its hard to do, but still. Need these at Suburbs, essentially at entry point to CBD from sub-urbs. These would most likely be points in the vicinity of Outer Ring Road. Ex: Park at Marathahalli Plaza, and take the Bus, as the area has buses to almost anywhere in Bangalore. This has been tried, yes, TTMCs (they are not meant to provide zero capex parking facilities to shop-owners in commercial areas), but result is different from the original goal. Empty Air-space above major intersections could provide the space. Take ORR/Airport Road cross at Marathahalli. That intersection is 120 ft by 120 ft block of road space or more. Think 5 floors above it. You get 72000 sqft. Take out 30% for driveway etc, you get 50000 sqft. At 64 sqft per car, 3 2-wheelers, you can take 780 cars or 2340 2-wheelers in here. Your BMTC Bus pass would be the entry key to these Park and Ride plazas. Things like dedicated lanes just before crowded signals, or bus-only 15 second signals at large junctions, or "fast buses" with fewer stops. Priority services operate only during commute hour, not at all times. This is slightly different from Last Mile shuttles. Instead of variants of same route to cover multiple roads near the origin and destination (like 333E vs 335A, or 333P vs 335E), run dedicated local area services to connect deeper areas to major bus stops. Helps with last mile also, and would make you and me take the bus even for our evening Foodworld and Foodbazaar trips. Try put a top 5, and not a large laundary list. Avoid listing the basics like passenger information system, clean buses, stop near bus stands etc. These things are low hanging fruits. If above 5 can be done, the basics would anyway get the attention and coverage. So here it is, an attempt at a prioratized summary. If there is interest, we can expand on each of the five items via separate detailed posts. Let me raise my hands up here. As long as it doesn't involve regular weekday workhour meetings, I am willing to help implement some of these. I swear, it will be worth it. I have been using BMTC daily on the ORR using V500K. On the ORR, buses get stuck between Jayadeva to Silkboard in BTM. Private vehicles take internal roads within BTM, whereas buses are stuck in mixed traffic. Here is the place to try out for bus special lane. Another problem is the stretch between Belandur to Marathalli where there are too many IT companies with very frequent stops. It would be good if we have a good large bus stop at Belandur Junction and at Innovative Multiplex Bus Stop, run the 500K series (500P,W,KC,KR,KS,KM,C) run non-stop and have a shuttle between these two junctions with many stops. ITPL bound passengers are not delayed by too many stops at this junction. People working in the companies here can change over to shuttle at Belandur/ Innovative Multiplex (popularly known as multiplex stop by conductors). The service road here is chaotic, otherwise shuttle could have run on the service road since it will be closer to companies as well as safer for the commuters for not having to cross the service road. Welded, foot over bridges to cross the road to other side on the ORR is another need which these companies together can afford for the safety of their employees. SEZ policy should specify that companies should provide foot over bridges to cross the road like the so many SEZ policies. Last mile connectivity - You can also get drop from anyone from home like Brother, wife, son etc if they are free at that time... I get drop by my wife on a Scooter. Evenings, I go by walk. Parking facilities in Bus Depots - There are so many depots on the 500K stretch, Vijaynagar depot, BHEL Depot, Kamakya Depot, Agara Depot. If they could build multilevel parking by subcontracting at least for cycles and 2 wheelers (2 wheelers are used by the most although people buzz about cars more.2 wheeler users need the buses badly due to safety issues on the ORR), cars based on feasibility, it would be a good last mile connector. Doables are same, however you cut! From this post which is nothing but rehash of other discussions on this (which even you have noted here) is very clear that doable things for BMTC are not many. However you look, you will arrive at same conclusions, but I would recommend the priority a little differently. What these means is for any meaningful improvement in BMTC service, route rationalization has to happen. Some may frown upon me for using this disliked word, but this is the truth. As you said, other necessary things can fall in place when this is taken up. Coverage is ensured by the structure of Radial + Circular routes, and Local area services. That is an assumption, and key reason for buying into this Big10 based radial matrix routing. Looks like the Big10 discussions have resumed on another post. Would be better to switch there. Meawhile, I will see if I can make a single view/page for al Big10/routing posts and comments. Click on BMTC tracker page to track all BMTC talk, that s one sure way. Stops more closer!!! Apart from Hosur road nowhere else have I seen stops very far. Generally there is a stop every 1/2 a km once in almost all areas excepting a few places. buses stop a signal and at stops and takes quite a long time at present itself. 1. The small stones dividers are removed and motorists jump over them causing the fast moving vehicles to brake. The divider must be replaced by high concrete ones. 2.Skywalks must be constructed so that pedestrians do not cross teh road risking lives. 3.2 wheelers and 4 wheelers can be banned on the ORR and they can go via the Tavarekere road. The large carriers can run via ORR so that atleast 50% of the vehicles will be half the road. It is enough if they are stopped in 1 direction only i.e the peak direction. 4.Right turns can be dissallowed at Udupi Garden signal in peak hours so that signal can release very fast and run smoothly. With respect to BMTC only few buses take a right turn. they can run via Mico check post and pass through MICO layout to 2nd stage. Improving Interchanges to be the top priority! I wish and pray that this assumption will come true. I do hope that experts working on RADIAL+CIRCULAR routes are working with a plan. Isn't nice to get that plan out in public? I read the list many times and after that I get a feeling that among the 5, most doable and most low hanging fruit is making "Changing Bus to BUS easier". I would cut this task into 2. One to list the existing one with a laundry list of things to change at these places that could achieve what you has said about Interchanges. Second is to identify potentially new interchanges that could facilitate more routes changing that people can make use of. I am sure it is not difficult to identify the new ones and mark them on the Google maps or something better. 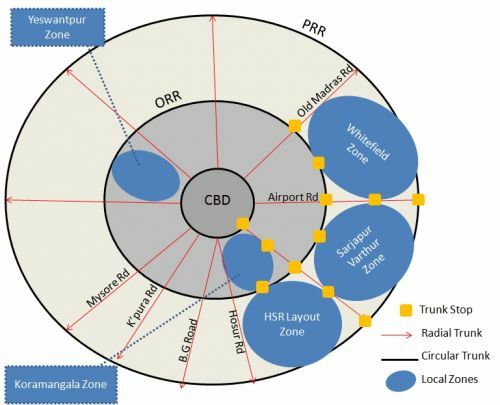 Bangalore being a circular city many circular routes can be introduced. Almost all nook and corner can be connected with each other. Similarly Electronic City-->Bommanahalli-->Vijayanank enclave-->Bilekahalli-->Jambusavari dinne-->Kaggalipura-->Bannerghatta-->jigani-->Chandapura-->Electronic city . Big-10 concept - lost enthu now? Things might be happening, but could it be that BMTC and others have lost interest in completing the Big-10 work? If the goal of Big-10 was to create 12 new distinctly branded radial routes, then that goal has been met. But we all though there is more work left to do. Why limit to Big 10 roads, start it to other major roads too. Not much of progress on Big 10 as SB pointed. Overlapping Big 10 with more A/C suvarna (Marcopolo) buses would be attractive. Also, apart from these Big 10 roads as identified by ABIDE, we may need to identify Major Bus Route corridors and Join them with opposite side major route corridors with good frequency and attractive A/C as well as non A/C buses. For example, 61 series buses for Vijaynagar, Chandra Layout, Nagarbhavi Layout can be linked up to say Ganganagar bound route. Similarly all the 43,45 and 36 series buses which connects to BankColony, Hanumanthnagar can be linked to say Malleshwaram-Matthikere bound buses with good frequency. Connecting the other end is very important like the Blue Big10 buses rather than just ending up in Big 10 roads like Green Big 10 buses. This will reduce the traffic in Majestic area. Already many series of buses run on these Big 10 routes say for example, 365 series on Bannerghatta Road and 356 series on Hosur road. Green Big 10 does not do anything else other than taking away some crowd which terminates in the Big 10 roads from these 356 / 365 series like buses. S1, S2 routes with A/C Marcopolo on the middle circle were taken out BMTC for lobbying Volvos. Atleast they can start non-AC S1,S2 routes. -G1 runs through the strech which is dominated by 333 and 335.